It is always uplifting to be involved with people who exhibit champion qualities in all they do. 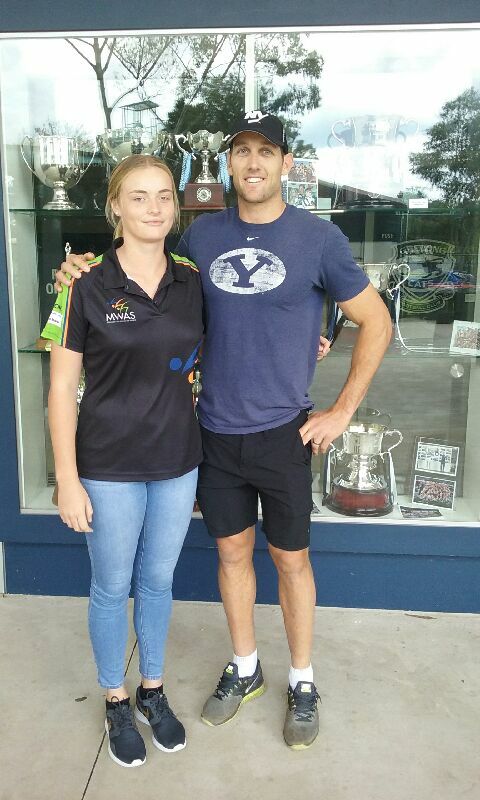 The MWAS would like to recognise the fantastic support given to the academy by Geelong AFL star Harry Taylor. Harry supports the MWAS Athlete of the Year by providing a unique sporting experience in Melbourne for the winner. Harry explains how this came about. “I got involved with the MWAS after attending a seminar with the athletes regarding professionalism in sport. Seeing young and aspiring athletes within the program act in such a committed way towards their chosen sports was inspiring to watch”. Emma Burke was the 2015 MWAS Athlete of the Year from the sport of basketball. Thanks to Harry, Emma recently flew to Melbourne with her mum to watch Harry and the Geelong Cats take the points over Brisbane at Simonds Stadium. Harry provided a tour of the Cattery for Emma that provided a window into high performance sport that Harry hopes may give a little more inspiration. “I have loved sport and grew up in the Mid West playing a wide variety of them. I feel a strong connection to the Mid West region and felt I could assist in galvanising the spirit and passion of athletes by providing them an insight into sport at a professional level in the AFL, as well as in the athletes chosen sport”. The experience certainly did provide inspiration for Emma and was timely coming just before Emma flew out again to represent the WA Country U18 team at the National Championships. I am sure that Emma will give her all as usual, yet this time there just might be that little spark of inspiration to what the future may hold.